Fall Sale! Take 20% Off Your Purchase on September 30th! We're falling for you ... All Club Goodwill REwards members will receive 20% off your entire purchase on Tuesday, September 30th! If you haven't signed up for our NEW rewards program, stop in and sign up at one of our participating Goodwill Store & Donation Centers today! Our Newest Store Set to Open October 10th in Frankfort! 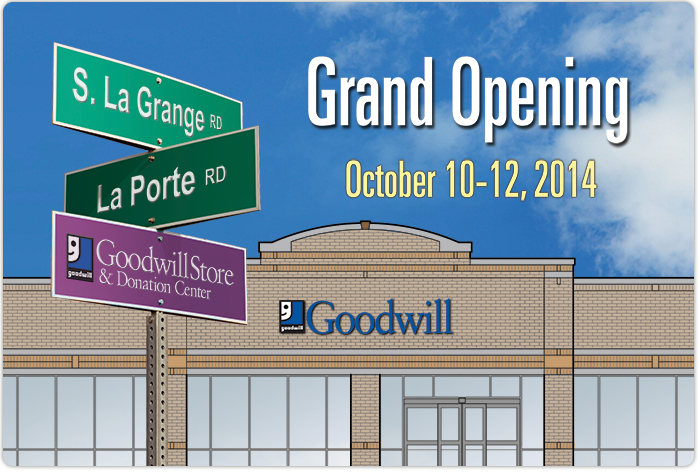 Our newest Goodwill Store & Donation Center will open in Frankfort, IL (19917 S. La Grange Road) on October 10th. Please join the festivities as we celebrate this grand opening all weekend long! Looking For a Position in Management? Goodwill is Hiring! The Goodwill Sale is Going on Now! The Goodwill Sale from Bon-Ton begins September 17th and will run through October 4th. During that time, customers will receive a Goodwill Sale coupon for every item they donate at any Boston Store, Younkers or Carson Pirie Scott.